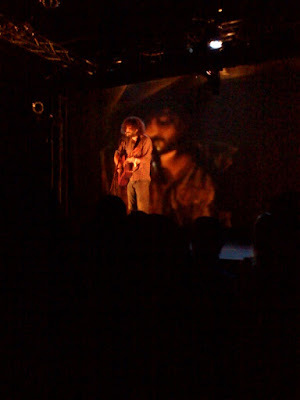 Caught Dan Bejar, aka Destroyer, in a show tonight at Echo Park's Echoplex, where he performed solo: just himself, his red acoustic guitar and some of his best-loved songs, going all the way back to 2000's Thief. We missed the Devon Williams band, but caught the second act, indie-jazz chanteuse Azita. Accompanying herself on electric piano with dusky, wailed/moaned incomprehensible lyrics, she reminded us of many acts past and present: Nina Simone, Carole King, Buffy Saint Marie, Rickie Lee Jones, Marianne Faithfull, Cat Power, Joanna Newsom, and Faun Fables, achieving none of their singular appeal. Having said this, we thought she had a rich, intriguing voice, a fluent piano style, and a charismatic stage presence. She's one to keep an eye on, though we recommend a few coherent covers of other people's songs. But we came to see Destroyer, and we were not disappointed. His guitar playing was crisp, energetic and flawless. The solo performance format brought the lyrical mastery of his songs to the forefront, showcasing them in an intimate, uniquely resonant way. The audience sat spellbound for most of the fourteen song set, breaking its rapture only to cheer wildly between numbers. He offered up generous, spirited renditions of songs his fans love, playing extensively from the aforementioned Thief, as well as Streethawk: A Seduction, This Night, and Rubies. Nearly fifteen years and 8 albums into his career, it was clear we were witnessing a special show by a major voice of our generation. His songs, with their mix of wit, clever rhymes and earnest melodies, unfold the way our minds do: joke after joke, until what emerges from the riddle at last is a chorus heartfelt, insistent, passionate, and suddenly profound.